All information about 436 Barrett Drive on this website is current and accurate. Enjoy spectacular views of Heavenly Ski Area, forested snow-capped mountain ranges and verdant valleys from your luxurious home and wrap around decks, perched on a mountainside 1300 feet above Lake Tahoe. 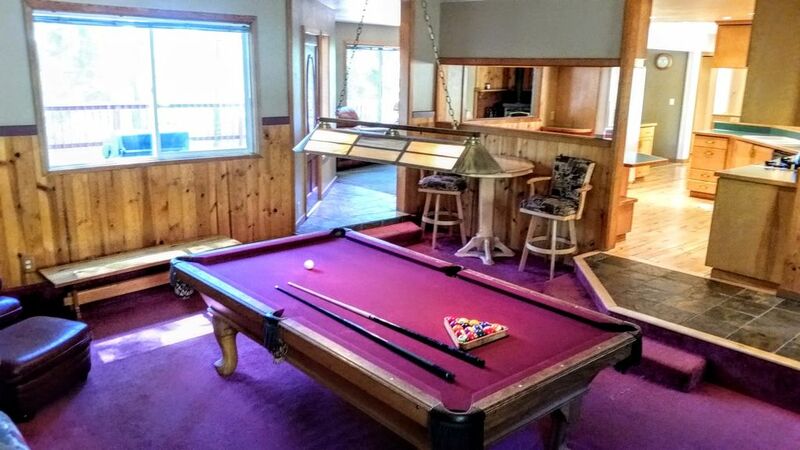 Entertain your large group indoors with your handcrafted oak pool table, game room, wood stove, knotty pine paneling, large modern custom kitchen and fun open floor plan. Step out from the living room, billiard room, master bedroom or first floor bedroom to your 8 person private hot tub (new oct 2016), 3 large decks, table tennis and fabulous views, secluded by fir trees of the National Forest. Indulge in quality, contemporary, comfortable mountain-themed construction, decor, bedding, furniture and equipment throughout your home. Two houses adjacent to 436 Barrett Drive are also nice vacation rentals. Search by map on vrbo.com, homeaway.com and other websites. You will reside in an excellent location! Hide out in your backyard National Forest, yet reside close to Tahoe's action-packed south shore. Drive only 4 miles to the big casinos, restaurants, theatres, shopping, music, entertainment, beaches, boating, sailing, swimming and skiing at Lake Tahoe's South Shore. Drive 1.8 miles to the uncrowded Nevada ski lifts at Heavenly Ski Area. Drive ½ mile to the beautiful Tahoe Rim Trail and off-road vehicle National Forest Service roads. Walk 4 blocks to the neighborhood playground, equipped with quality equipment and a ball field. Walk, ski or bike 3 blocks to trails that lead to the Tahoe Rim Trail and Castle Rock. Walk from the back yard into the Toiyabe National Forest, where you can hike, mountain bike, ride horses, sled, ski and snowmobile. 436 Barrett Drive, Stateline NV 89449 is within a 2 hour drive of 18 ski areas around Lake Tahoe, California and Nevada! Choose the best ski area as you leave your driveway, based on snow conditions, ski conditions, road conditions, weather conditions, traffic conditions, terrain, views, location, driving distance, cost, amenities, and preference. Heavenly Ski Area's Nevada lifts are just 3 minutes away. Heavenly ski area is the highest, tallest & largest ski area near Lake Tahoe, with 3500' of vertical. Heavenly ski area offers the most and best views of Lake Tahoe. Heavenly ski area has one of the best ski instruction programs in the U.S.
Avoid the lines and waits on the California side of Heavenly. Parking, lift ticket, rental, instruction, food & lift lines are much shorter at Heavenly's Nevada lifts. Get on the slopes and to the top of the mountain much faster & easier from the Nevada lifts. Ski over to the CA side at lunchtime, when the lift lines are shorter. Then come back to Nevada. Boulder lodge offers full instruction facilities and uncrowded gentle runs for kids and beginners. Stagecoach lodge has a fast lift to get you to uncrowded & challenging Nevada slopes quickly. In the upper right side of this page, enter your Arrival Date and Departure Date, and click Detailed Price. In the upper right side of this page, enter your Arrival Date and Departure Date, and click Request to Book. 436 Barrett Drive is 1 mile from Kingsbury Grade, (Hwy 207). The Grade is a good road. The Grade is the fastest, shortest, and most direct route in and out of South Lake Tahoe. Lake Tahoe's largest and best casinos are at the bottom of the Grade. Heavenly Ski Area's Nevada ski lifts are at the summit of Kingsbury Grade. Kingsbury Grade has light traffic compared with other Tahoe highways. Relatively few people know that the Grade is a good road in and out of the basin, because it does not look like a major road on most maps. So the Grade has much less traffic than the other 5 routes in and out of the Tahoe basin. The Grade does not traverse any towns. The other routes in and out of the Tahoe Basin traverse many busy incorporated areas. You cross only one stoplight between 436 Barrett Drive and Tahoe's largest and best casinos. You cross no stoplights between Hwy 395 and 436 Barrett Drive. Hwy 395 runs directly to Reno International Airport, and is the main highway on the eastern side of the Sierra Nevada from Southern California to Northern California. The Grade is a moderate speed two lane highway, & is less stressful to drive than Hwy 50. Highway 50 is the route that most people use to access most other areas in South Lake Tahoe. Highway 50 is a curvy 4 lane undivided highway. Traffic is much heavier and moves faster on 50. Kingsbury Grade can get you to Reno International Airport on time when other roads can't. Kingsbury Grade offers spectacular views of the Carson Valley and surrounding mountain ranges, and passes through wildlife areas and ranches. The Nevada side of Lake Tahoe is much less densely populated than the California side, so you encounter fewer people and less traffic congestion and weather related delays. Also, snow removal services are much better on the Nevada side of Lake Tahoe. 436 Barrett Drive is surrounded by excellent snow removal services. 436 Barrett Drive gets large amounts of snow due to its high elevation and geographic situation. Despite the heavy snow, 436 Barrett Drive is very accessible due to its proximity to key highways and due to the excellent snow removal services in the neighborhood. Snow removal services in the neighborhood are purchased directly by property owners. Because the service is private, and we pay them directly, they are very responsive and efficient. 436 Barrett Drive is 100 yards from the neighborhood school bus route. Schools almost never close in Tahoe. If the big heavy school bus can get there in the snow, your small light car can get there in the snow. 436 Barrett Drive is 1 mile from Kingsbury Grade, (Hwy 207), along the school bus route. The Grade links Lake Tahoe with the Minden, the Douglass County Seat, in the Carson Valley. Because the Grade is the main road for all the county government vehicles in the area, the County road and snow removal crews keep the Grade in good repair and snow free. The Grade is also the most direct route in and out of the Tahoe Basin. You spend relatively little time driving in the snow at high elevation when you drive the Grade to and from the Lake. 436 Barrett Drive is at the crest of the Sierra Nevada, but is also at the edge of the Great Basin and desert. When you cross Daggett Summit on the Grade, just 1.5 miles from 436 Barrett Drive, you drop immediately into the arid Carson Valley. The Carson Valley is in the rain shadow of the Sierra Nevada, thus the Grade is a fast and snow free route to Lake Tahoe. At 7,500 feet above sea level, 436 Barrett Drive is adjacent to the Toiyabe National Forest. Overlook the peaceful Forest, snow-capped mountain ranges, and Carson Valley from the living room, deck, and master bedroom. Climb a 150' mountain top next to 436 Barrett Drive for a stunning panoramic view that includes Lake Tahoe, Heavenly Ski Area, South Lake Tahoe, Desolation Wilderness, Sierra Nevada, Emerald Bay, Carson Range, Castle Rock, Carson Valley, Carson River and White Mountain Range. Hike, Cross-Country Ski, sled, and climb on backyard trails and Castle Rock. Walk, ski or ride a few blocks to trails that take you to the Kingsbury Trailhead of the Tahoe Rim Trail for hiking, mountain biking, cross-country skiing, views of Lake Tahoe, and snowmobiling. You can also drive less than 1 mile directly to the Tahoe Rim Trail Kingsbury Trailhead. Also enjoy these activities and off-road motorized vehicle touring on the many National Forest Service roads at the Tahoe Rim Trail Kingsbury trailhead. Douglas County home rental permit number 06 - 328. Nevada Beach National Forest Campground and Zephyr Cove. I lived at 436 Barrett Drive, in Stateline NV, in the Tahoe Basin in 1998 and 1999. I bring my family to 436 Barrett Drive frequently. We love visiting our place in Tahoe in all seasons. I bought this house to live in it and vacation in it. It is really close to great roads, so I could easily and quickly get to great entertainment, shopping, restaurants, ski lifts, work, and walk out the back yard into the National Forest. 436 Barrett Drive is a very comfortable house that has great views of mountain ranges and Heavenly Ski Area. The deck and the hot tub are extensions of the house adjacent to the living areas and make the house feel bigger. The floor plan is open and flows from room to room, so it is great for entertaining and conversing with family and friends. The kitchen is really big and open and integrated with the rest of the living areas. The National Forest is in the back yard and we have a lot of fun sledding, hiking, skiing and viewing wildlife there. First floor bathroom has huge granite-tiled jacuzzi whirlpool air-jetted tub / shower. It is like a private hot tub spa. 436 Barrett Drive is just a 3 minute drive from Heavenly Ski Resort's Boulder ski lift. Walk from the back yard directly into the Toiyabe National Forest. Overlook Heavenly Ski Area and several mountain ranges. Enjoy Spectacular Views of Heavenly Ski Area and Several Forested Snow-Capped Mountain Ranges as You Overlook the Adjacent Toiyabe National Forest. Cross-country ski from the Tahoe Rim Trail and other trails in the surrounding mountains and Toiyabe National Forrest into the back yard. Cross-country ski from the back yard to the Tahoe Rim Trail and other trails in the surrounding mountains and Toiyabe National Forrest. Enjoy shade from fir trees and natural air conditioning via opening many windows at 7500 feet in the mountains. Enjoy watching the fire through the glass door in the wood stove in the living loom. High-Speed Internet Cable Modem High-Speed Wireless Router 2 New High-Speed DVR / Cable Converters 2 Internet-enabled Rokus play Netflix and other apps on the TV Monitor and speakers. Wood Stove can be used as a fireplace when you open the door. Wood provided. Automatic drip maker, french press, and grinder. Spices, flour, sugar, baking powder, baking soda, ketchup, etcetera. New High-Speed Internet Cable Modem Fast Wireless Router 2 New High-Speed DVR / Cable Converters Internet-enabled 3D Blu-Ray Player plays Netflix and other apps on the TV Monitor and speakers. Play many digital music channels via the TV Cable Converter. New High-Speed Internet Cable Modem and Internet-enabled Rokus playsNetflix and other apps on the TV Monitor and speakers. World Famous Edgewood Golf Club is 8 minutes from 436 Barrett Drive. 2 Steps down and 1 step up in Summer. 1 Flight of stairs down when snow is on the ground. We had a wonderful time. We enjoy the weather as well as the location. Sadly the 2 inflated beds had a leak and we didn’t like the aspiral stairs other than that everything else was great. Lots of snow, great location. We had a lot of fun with the family. Thank you for your excellent review and information. If only you had written or called me during your stay, as you agreed in our rental agreement, I could have provided you with additional mattresses during your stay. I have installed two foldable memory foam mattresses; they neither hold air nor leak. No guest will cause them to leak and not report the problem. We had a great time! Great Views! Spacious! Clean! Nice hot tub! Had a great walk out the back yard into the forest. We climbed a hill and enjoyed an amazing view of Lake Tahoe and Carson Valley. Heavenly and Tahoe have spectacular scenery! We zoomed down the groomers on Friday, and floated on the fresh pow on Saturday. The house was about one quarter of a mile off of the Tahoe Rim Trail. It was a perfect spot to take a quick break and get showers and a bed for the night. The house was great. The billiard room could use some updating but it was prefect for us. The property managers were really nice. House had everything promised. Housed our group and did not have any issues. Experience in house however was that it was rather musty and dark inside. There were beer cans strewn across the back patio area from previous patrons. Stands out as the least welcoming Tahoe rental. There are simply so many other good options that this one is worth passing over if possible. The property manager told me that the previous guest had a beer party with a bunch of guys who spilled a lot of beer and generally left the house very dirty. It can take a few days for that smell to dissipate. I apologize the beer smelled when you arrived. The carpets were professionally cleaned after your stay. I'm so glad that the house had everything promised! Fun, cozy feeling cabin stay in Tahoe! Easy check in/out. Cute place with the tahoe cabin feel. Only sleeps 10 adults comfortably in beds/pull out sofa. Thank you for your kind review. 436 Barrett Drive also has an air mattress for 2 additional adults. All beds are described in the property description. - Walk from the back yard into the Toiyabe National Forest, where you can hike, mountain bike, ride horses, drive off-road vehicles, cross-country Nordic ski, downhill ski, sled and snowmobile. Golf: 436 Barrett is 8 minutes from world famous Edgewood Golf Course, host of many celebrity golf tournaments. 436 Barrett is also close to many other golf courses in the Tahoe basin and in the Carson Valley. Ski: 436 Barrett Drive, Stateline NV 89449 is 3 minutes from 2 lifts at Heavenly Ski Area. Heavenly Ski Area is Tahoe's largest ski area and has the best views of Lake Tahoe. 436 Barrett Drive is within a 1 hour drive of 15 ski areas, including Kirkwood, Squaw, and Northstar. View Detailed Price and Payment Schedule: Enter your Arrival Date and Departure Date in the upper right corner of your browser. Click Detailed Price.